Tomorrow is Valentine's Day! While most of you are working on amazingly cute crafts and gifts, we're getting ready for our spring garden. Ha. 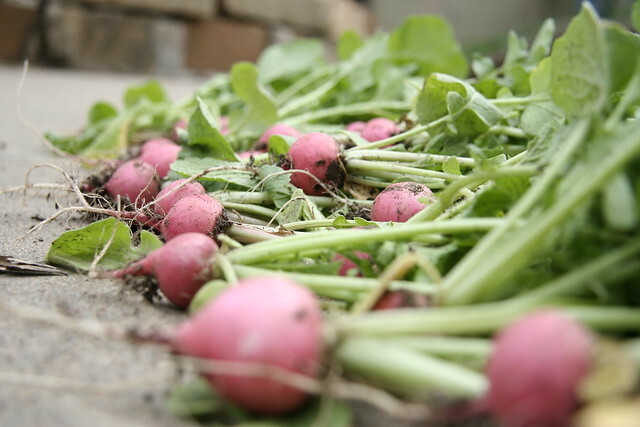 If you live in Oklahoma, or at least in our gardening zone, you should start thinking about what you'd like to grow because February 14th marks the day when you can get your spring veggies going. If you don't have your beds ready, don't worry. We've planted spring stuff on into March and have great success. Let's get started, shall we. Spring is by far my most favorite growing season because I love home grown salads. I can eat them every day and usually eat at least two a day during spring harvesting. Here's little run down of what we're planting this weekend. We get our onion plants from Warehouse Market. They're usually the cheapest in town and they do great but make sure you call before you go to see if they have them in. As for seeds, we get them anywhere and everywhere, Warehouse Market, Lowes, online through Johnny's seeds, Burpee or anywhere we happen to see a good deal or fun variety. The following pictures are how we did it a few years back in a bucket. Side note, we have limited bed space so my husband prepared several buckets with soil. 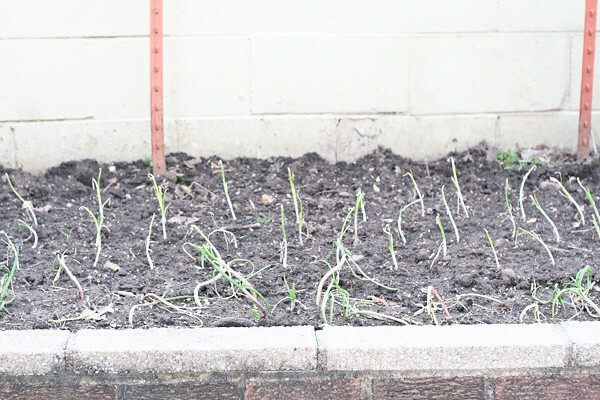 In the spring they held onions, greens and radishes and then tomatoes in the summer. So if you don't have a big bed, get a couple buckets! 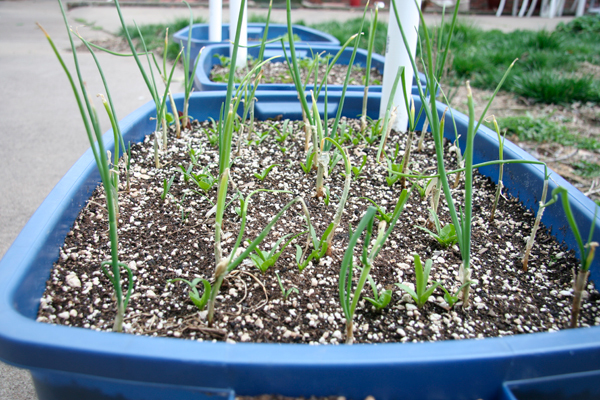 Get your soil prepared then make holes all over for your onion plants. That's a mix of red, vidalia and yellow. 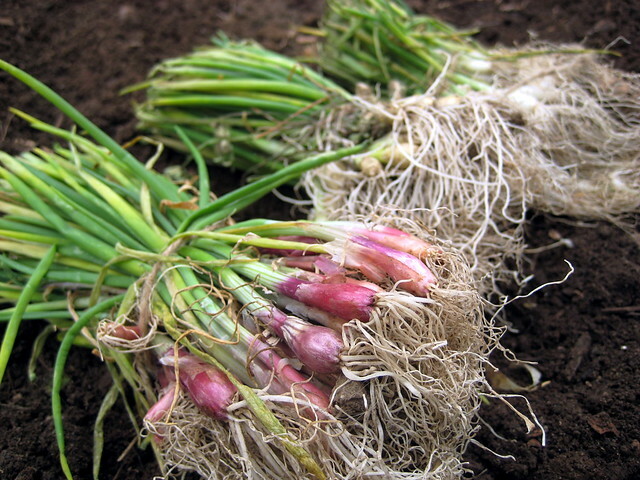 Plant your onions and pat the soil back in around them. 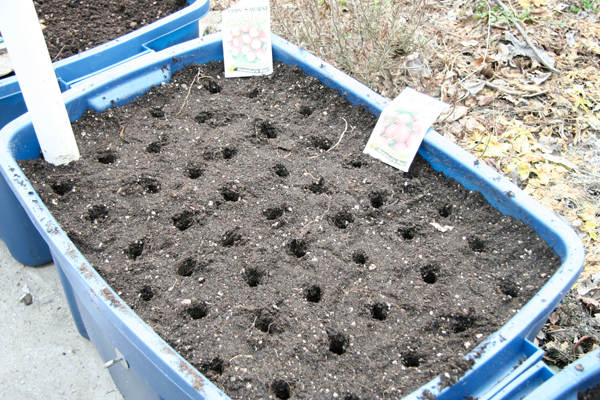 Then, in between all the rows, plant your spinach seeds according to the package, cover and water. 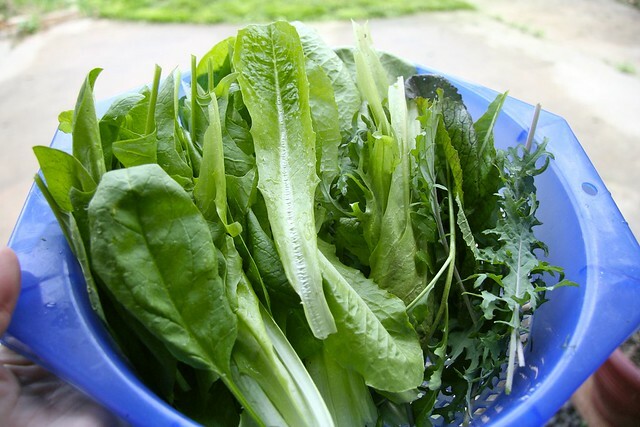 You can actually start thinning some of the spinach by picking those tender, baby leaves and using them in salads, or smoothies. And you'll be picking spinach like crazy! 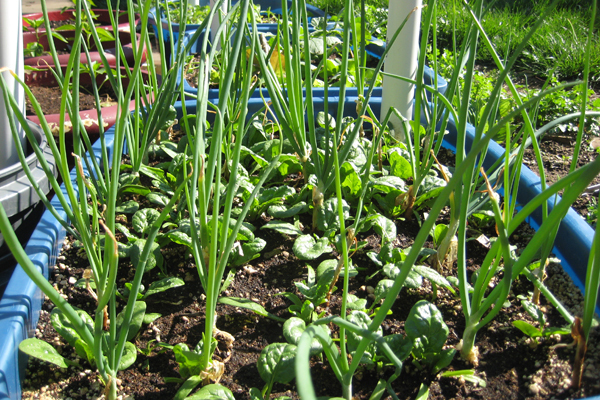 Here's a couple pictures of onions and greens from another bed. 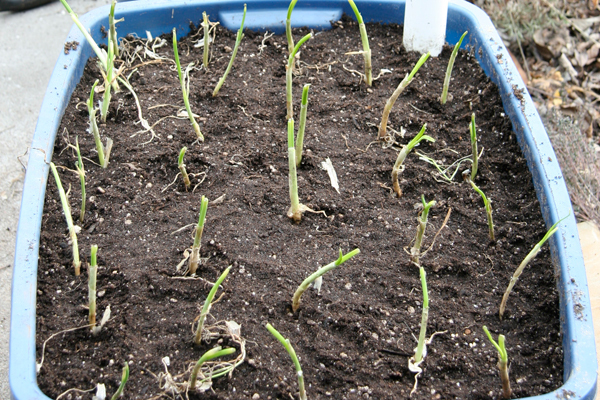 A general rule on picking onions is wait until the tall greens start to fall over. We plant enough to pick some in the early spring, when they're still small, and to also have enough to keep in the beds so they get bigger. Once the spring turns to summer and temps start rising the greens will bolt, which means they'll go to seed. When they do that, they get bitter and don't taste as good. 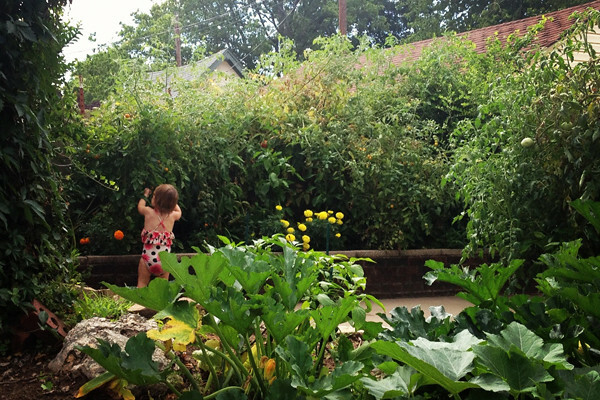 No worries though because about that time it will be time to plant your summer veggies! Stuff like squashes, tomatoes, peppers, etc! More on that as the season gets closer! And this what that same bed in the middle of the summer! You can see more of our gardening pictures on my flickr photostream, I grew this. If you have any questions, I'd be more than happy to help. Just leave it in the comments and if I don't know the answer, I'll as my grandpa! Ha!! So go on, enjoy Valentine's day and get ready for spring gardening! Thank you so much! 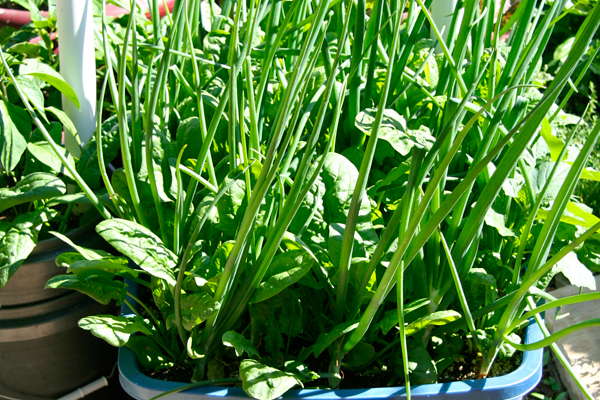 We actually have the best onions, tomatoes and spinach in our buckets so good luck! Clearing a bed o ut to make room for veggies, etc always seemed super daunting. The idea of the bucket is awesome! What do you do for drainage? Or is there enough soil in a bucket that size that it's not really needed? We get the landscaping buckets that have holes in them. Any bucket will do, as long as you make a few holes in the bottom for drainage. The landscaping buckets just tend to last longer in the sun so you don't have to replace them for a few years. What is the pipe for in the buckets? Is that how you water these? 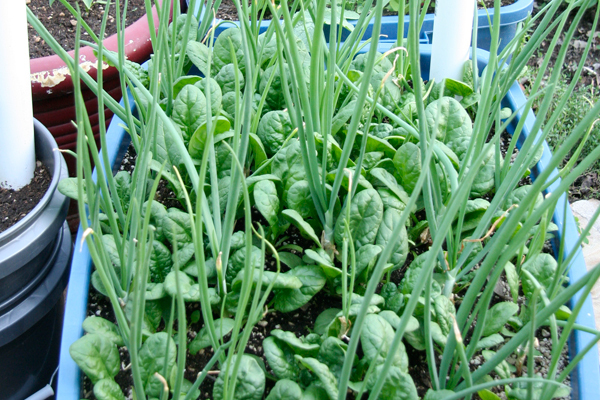 How often do you have to water the onions, spinach, lettuce, etc? I can't believe you really grew all that in Rubbermaid boxes. I am going to go buy some TONIGHT and maybe get some stuff going this weekend. Can I pay your husband to come start a garden for me? LOL! Oh my, that's a long story. Let's just say the pipe was the watering place for a super-crazy bucket my husband built. It's so complicated but any bucket will work. Just make sure there are holes for drainage. Do you have any suggestions on a good cherry tomato? I have tried every year and the heat kills them! We live in Jenks & I have 3 large raised beds. We built the beds 4 years ago. The soil is not as rich as it used to be. 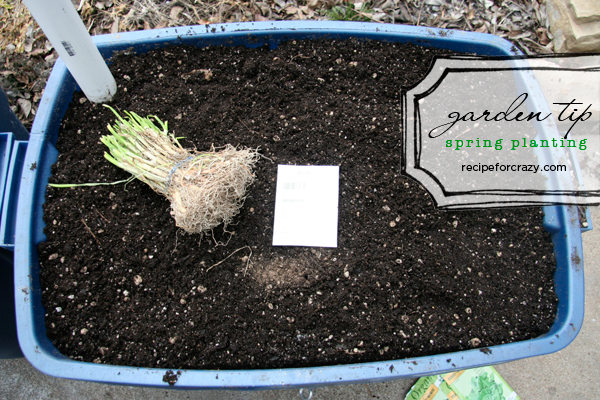 What tips to you have to prep our soil? Love your blog! I just posted our soil mixture today - check it out and let me know if you have any other questions. Thanks! I found you through Ashley - Under the Sycamore. I am so excited I have been thinking about gardening, I did it years ago and want to try a small garden again, so yes I have a few questions. I love the idea of using plastic bins, if I am going to grow lettuce and spinach, do I need them to be that deep? Also I had a garden 15 years ago. I invested in good soil way back then, do I need to replace the soil or add to it, if so what do I add. Lastly, you say put the onions in a cool dry place, I live in Texas, which is similar to OK weather, do you leave them in the garage in the summer too? If you're just planting spinach and lettuce in buckets, no they don't need to be that deep. 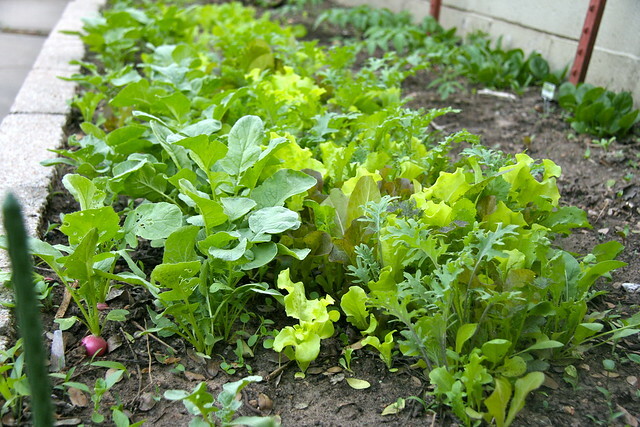 As for the soil, you don't need to replace it but you should add some fresh soil and fertilizer to it. And the onions, yes, we leave them in the garage all summer. Our garage doesn't get crazy hot though so if yours does, you may want to find an area in your house somewhere. If you have a basement, that would work best. Thx for the tips, cant wait to start to do this in my own garden. Hope I can find enough time though. Thx again for the tips. 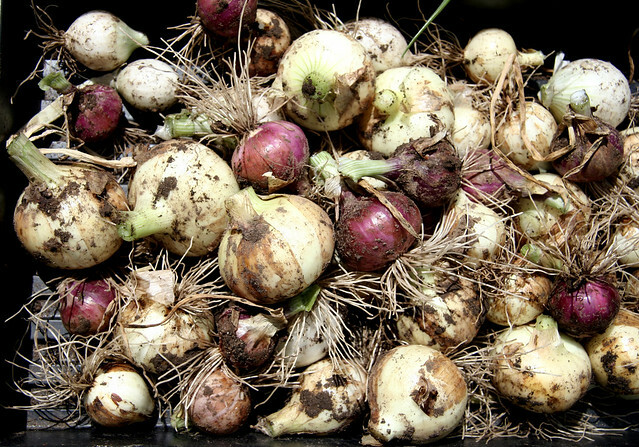 I bought onion bulbs rather than the little plants that you used. Is there an advantage to using the plants over bulbs?